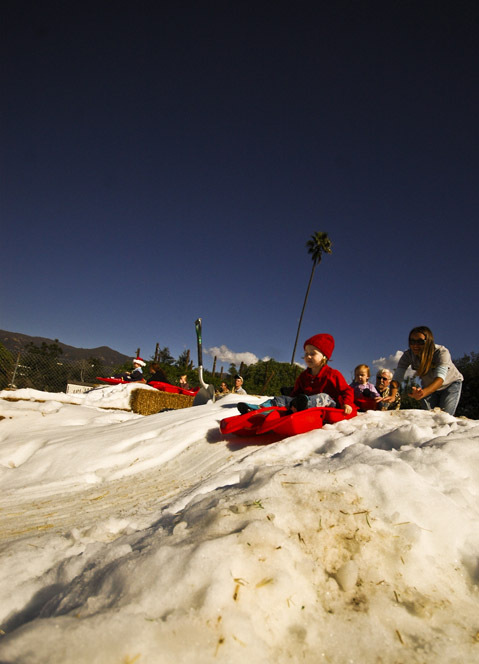 Snow in Santa Barbara? Not likely. Today, however, thousands of people flocked to the Santa Barbara Zoo to take a look at animals and children frolicking in more that 40 tons of snow. It was all part of the Snow Leopard Festival, held to raise money for the critically endangered Snow Leopards. Hailing from the cold climes of the Russo-Chinese border, the two Amur Leopards, who also reside in the zoo, benefited from the snow as well. A child enjoying the sledding hill. Brought in by semi truck, the snow arrived before 5 a.m., and was met by zoo keepers and staffers who helped unload the delivery into animal cages and at the hilltop park at the zoo’s center. Staff even constructed two small sledding hills in the park, which, by 10 a.m., were packed with enthusiastic kids. Animals could be seen romping in the snow as well – albeit within their enclosures – with snow leopards rolling playfully in it, and Asian Elephants forming and tossing snowballs with their dexterous trunks. The snow attracted more than the usual number of zoo visitors for a Sunday afternoon, with the official count being upwards of 4,000 guests. 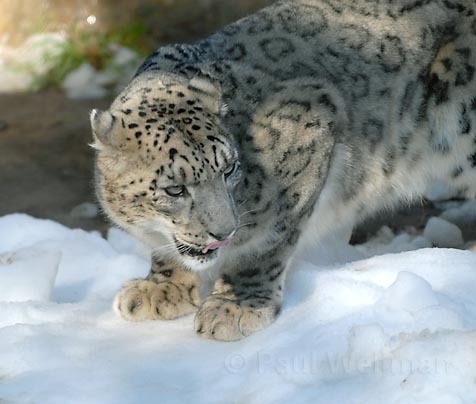 Dean Noble, the Zoo’s director of marketing, said that the money raised by admission fees will benefit the Snow Leopard Trust, which has worked since 1981 to help protect snow leopards and their central Asian habitat. Heavily involved in animal conversation efforts, the Santa Barbara Zoo is a member of the Association of Zoos and Aquariums (AZA), which ensures that species – particularly endangered ones – get the space and habitat they need in captivity. “Zoos used to be for entertainment. Now they’ve become modern arcs,” said Noble. 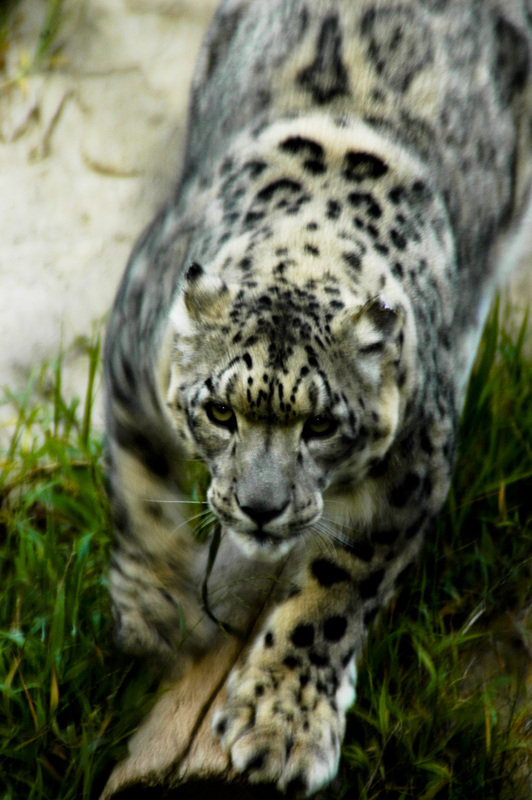 Snow leopards, which originally come from the Himalayan regions of central Asia, live at some of the highest altitudes known to be habit to mammals. They feed primarily upon wild mountain goats such as Ibex and Markhor, as well as marmots, moles, and birds. They occasionally eat domestic sheep as well, causing concern from farmers who may view the loss of one or two sheep as a financial catastrophe. “Their food is getting pretty scarce,” said Wes Hardin, one of the zookeepers. “So when the food is running out, they come down the mountain and feed on livestock. This is a big problem with farmers.” Due pressure from poachers – who sell the furs and bones of the leopards – and farmers who view them as pests, snow leopards are currently listed as critically endangered, with only 3,500 to 6,500 existing in the wild. The mighty huntress, stalking her prey. Hardin, the zookeeper in charge of all the big cats, noted that although these animals have long since adapted to the warm Southern California climate – primarily by shedding large amounts of fur. 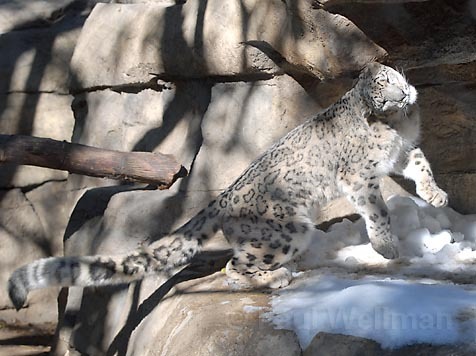 The two snow leopards – Beauregard, a male, and Nepamar, a female – sleep in a room that is usually about 20 degrees cooler than the air outside, and are accustomed to receiving regular rations of ice and frozen beef blood as a part of their diet. Still, Sunday was the first time the pair had been exposed to snow in a while. Born in captivity, both have been residents of the Santa Barbara Zoo for about two and a half years. According to Sheri Horiszny, the zoo’s assistant director of animal programs, there are currently 154 snow leopards living in 75 AZA-accredited zoos. 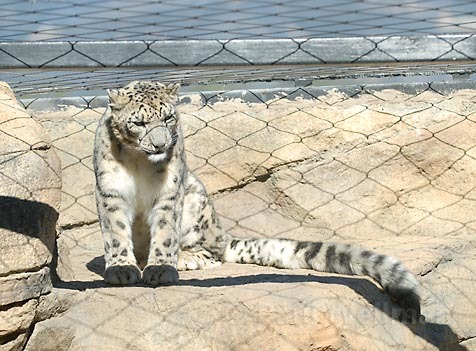 The event at the zoo was aimed at reaching out to the relatively affluent American public, but, Horiszny says, a lot of public outreach is conducted in the Himalayas in communities that regularly encounter the snow leopards. The Snow Leopard Trust buys arts and crafts from local artisans and sells them to help raise money for other efforts, such as anti-poaching programs. “Because it’s spread out, the approach is very different in each area,” said Horiszny, “but when there’s money to be made in anti-poaching, it shifts everything away from poaching.” She continued that many of the anti-poaching staff members hired by conservation groups – who are paid to dismantle traps and catch poachers – are former poachers who are familiar with the animals and the methods of poaching them. 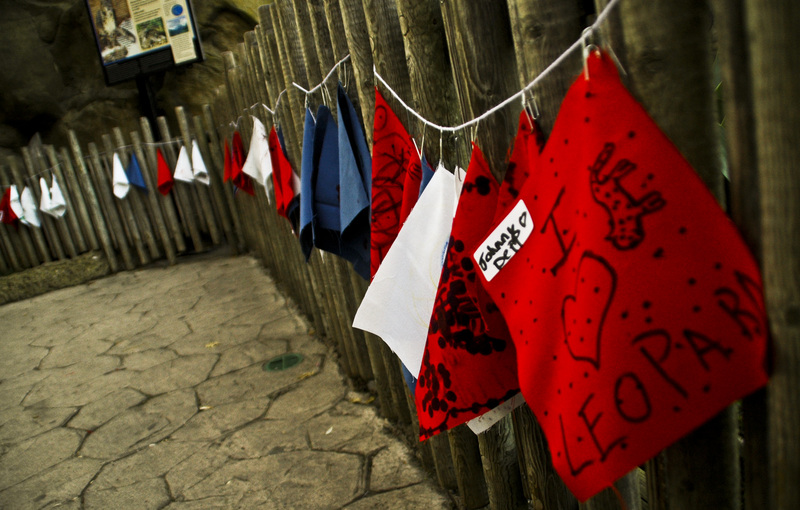 Support flags adorn the walls near the snow leopard enclosure. 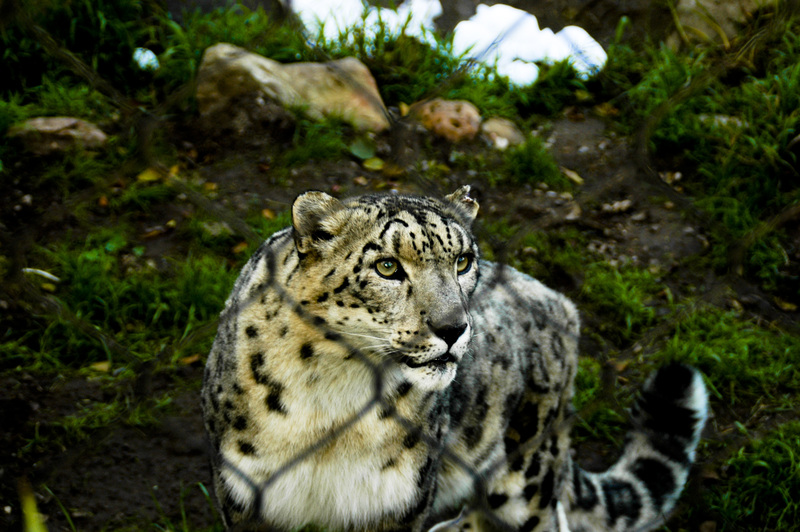 “You can help out the snow leopards by visiting the zoo, and visiting snowleopard.org,” said Horiszny. “This zoo – separately from this event – regularly contributes to the Snow Leopard Trust.” For more information about snow leopards or other endangered species housed at the Santa Barbara Zoo – which is located near Milpas Street and Cabrillo Boulevard at 500 Ninos Drive – visit santabarbarazoo.org.